When I'm really frustrated and mad and don't feel like riding a bike, I reach for a white tube. 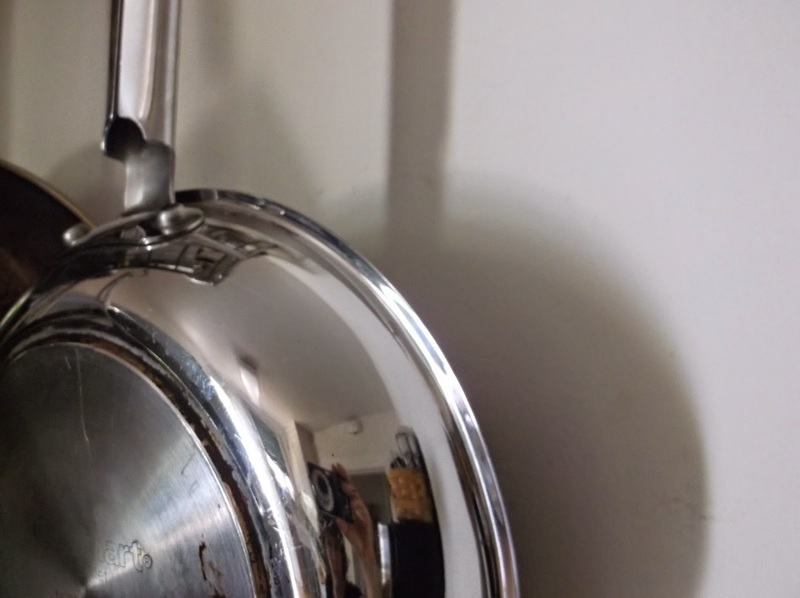 Our pans are old but they're stainless steel, solid and good underneath. Put a lot of energy into polishing and they start to look a lot better. Much improved. Beyond the pot rack and kitchen, that feeling's elusive. Real life is full of things headed in the wrong direction. State agencies that put their head in a dark place and refuse to take it out. Peet's Coffee, now with long lines and high prices and crappy treats, slouching toward Starbucks. The Bay Area, full of smart successful types who can't figure out the whole housing thing so that humans can live here. The city where I'm lucky enough to live, claiming to be bike-friendly but at the same time thwarting all attempts at infrastructure. Green bike lanes? Green paint is really expensive. Friends on bikes feeling threatened and marginalized. The people and politics of bike coalitions, disorganized, ineffective, accountable for nothing. Daily clashes with other trail and road users on my commute. The whole thing about jockeying for space. Gluten. The world is full of gluten. It's lurking in tortilla chips, even. The past two weeks, not being able to think or feel normally. The noise of social media. Having killed investigative journalism and replaced it with, let's be honest, mostly personal drivel on Facebook and Twitter. Trying to do really well in the chaos of work, without knowing exactly what that looks like or what I can deliver. It comes from Switzerland, where life is orderly. Lives in a white tube and lasts for years and works like toothpaste for stainless steel. First you rinse the pan in hot water. Then just put a dab of grey paste somewhere on the outside. Doesn't really matter where or how much. Rub it in with a paper towel. Work in all the grey stuff until there's none left and the pan is shining. More gunk on the pan? Add more paste and repeat. All the little marks and scuffs and particles that accumulate with daily use, they come off on the paper towel. Voila! Shiny pans don't make all the other stuff OK. On the other hand, it doesn't hurt to have visible evidence that a little effort can turn things around.